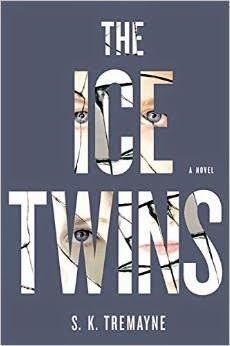 This is a book review for The Ice Twins by S.K. Tremayne. I received this ARC from NetGalley in exchange for my honest review. This book was originally scheduled to be released for publication today. Looking on Amazon, however, shows the new publication date is scheduled for May 15 of this year. A year after one of their identical twin daughters, Lydia, dies in an accident, Angus and Sarah Moorcroft move to the tiny Scottish island Angus inherited from his grandmother, hoping to put together the pieces of their shattered lives. But when their surviving daughter, Kirstie, claims they have mistaken her identity--that she, in fact, is Lydia--their world comes crashing down once again. As winter encroaches, Angus is forced to travel away from the island for work, Sarah is feeling isolated, and Kirstie (or is it Lydia?) is growing more disturbed. When a violent storm leaves Sarah and her daughter stranded, Sarah finds herself tortured by the past--what really happened on that fateful day one of her daughters died? This was such a gripping story. It was also very creepy. Am I the only one who finds identical twin children just a bit on the creepy side? Maybe it isn't all twins; maybe it's just these. I guarantee that you will be as creeped out as I was. The book begins approximately fourteen months after one of their twin girls dies in a tragic fall from a balcony. Sarah and Angus believe that the girl who died was Lydia, until one day when she says "Why do you keeping calling me Kirstie, Mummy? Kirstie is dead. It was Kirstie that died, I'm Lydia." And with that statement, Sarah's life comes crumbling down and the mystery begins. Because the girls were identical twins with matching DNA, it's impossible to do a scientific test to know for sure. So Sarah is plagued with questions. What if she made a horrible mistake? What if Kirstie is trying to deal with her grief by becoming her sister? How well does she actually know her children Now it is tough to write the surviving twin's name because there is so much back and forth and so much confusion. I don't want to give away any major spoilers, so I will just stick to calling her "Kirstie" in my review. Sarah makes some questionable decisions when Kirstie makes this statement such as ignoring it. Then she tries to placate her and give her what she wants, even if she doesn't believe Kirstie is telling the truth. I can forgive these decisions though because of all the grief and shame that she is feeling. Meanwhile Sarah and Angus move to a remote island in Scotland for a fresh start and the creepiness factor increases by a thousand. Suddenly, Kirstie starts seeing her dead sister's ghost and Sarah becomes even more disturbed and more convinced that her daughter is losing her mind. But this was such a well written mystery that it was hard to figure out who was going crazy: Sarah, Kirstie, or even Angus, who is hiding some secrets of his own. The mystery of which twin dies unravels to its climax, where a bigger mystery is revealed: the mystery of what really happened the night Lydia died. The author writes of the unpredictable, ferocious Scottish winter and the isolation of the island with such vividness and intensity that I could swear I was right there. The remoteness of the island just adds to the creepy factor. This is an amazingly haunting, suspenseful mystery that will keep you up just so you can find out what happened. Buy/Borrow/Skip: Buy, but be prepared to be creeped out! Wow, this sounds super creepy! Great review! Yeah, this one sounds incredibly eerie; I'll have to let my friends who enjoy a good chilling thriller to check this one out! Haha nope I also find twin children creepy. I think them often being used in horror movies and such is probably why. This one sounds awesome, though, I love creepy books! I also hadn't heard about it before but I'll def have to keep an eye out for it! Great review! Nightmares about the twins from Shining. Yep. Never could recover from that. This sound absolutely creepy! Joyous Reads, can you believe I have never read The Shining? Ha And yes, this book is supremely creepy.